Hello! 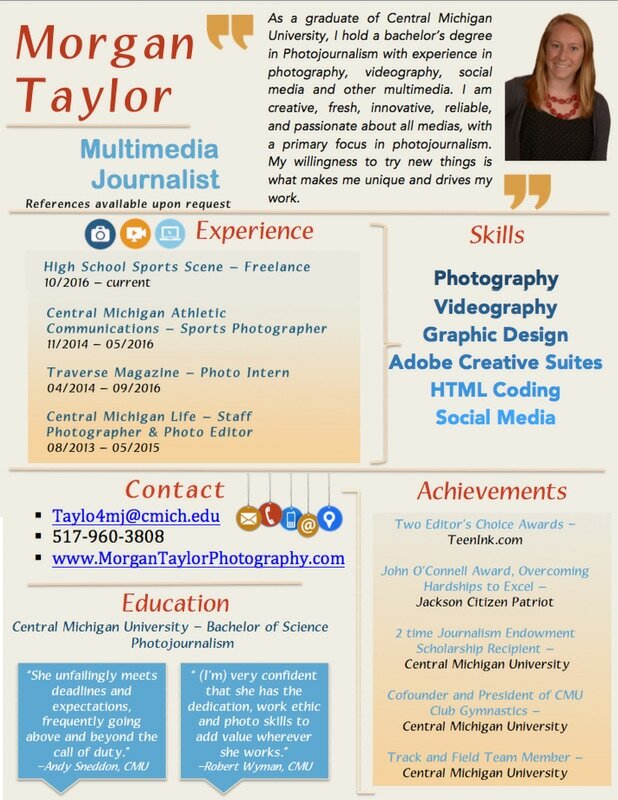 My name is Morgan Taylor and I am a recent graduate from Central Michigan University. I hold a bachelor's degree in Photojournalism, pursuing my dream of a career in sports photography. I have worked as a staff photographer and an assistant photo editor at the student newspaper, CM-Life. I also worked for Athletic Communications, where I took photos of games and athletic related events for the university. My photos appeared on Facebook, the University website, and various places around campus. During my time at CMU, I have acquired hands-on experience with studio lighting, portraits, event coverage, sports, photo editing, video shooting, video editing and page design. I have expertise using professional programs, such as Photoshop, InDesign, Illustrator, iMovie, Premiere Pro, and Final Cut.